This week I almost finished my white Nina Ricci overblouse – its my second outing for this pattern – I already made a green one. It was still quite hard work, but slightly easier this time. I am disappointed that I haven’t finished it yet – but I have started making my silk dress so have been a bit distracted. I added a tiny little bit of curve at the upper hip, adding around 1/4 inch to the two back pieces – overwise we just have the inch above the bust dart that I need for my relatively long torso, and half an inch in the length above the waist. 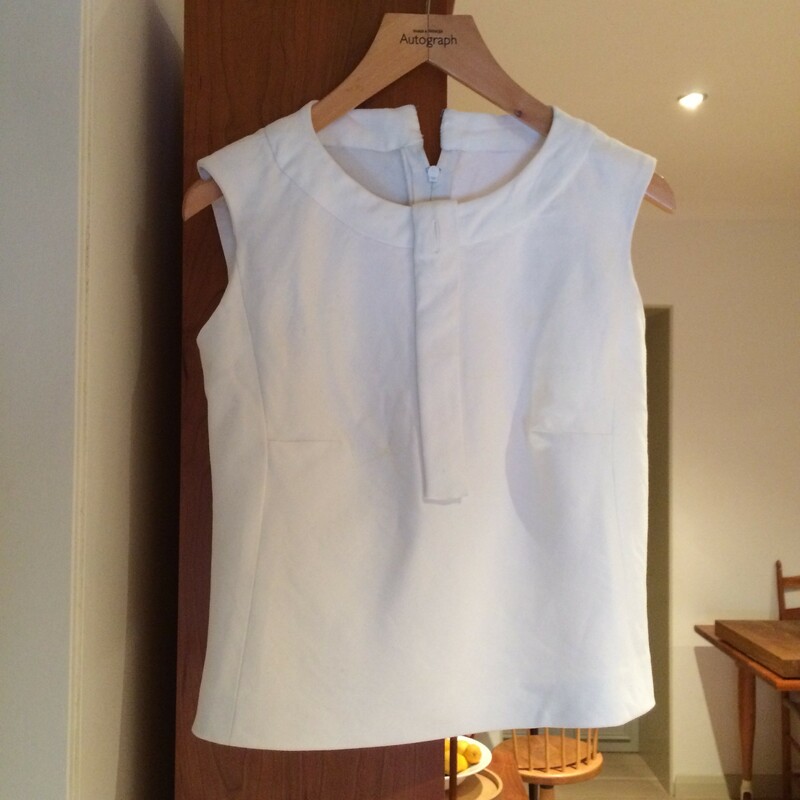 I had some fairly heavy white cotton with a little Elastane in it, left over from my Geoffrey Beene dress. The overblouse is cut on the bias. I decided to use silk organza for the underlining. Although I do like using silk organza very much I was put off by the price. My friend Demented Fairy kindly told me where to buy it cheaply and I have been using it much more regularly ever since. You order it though eBay – it is not very wide (104cm) but it is only about £4.50m! The quality is not as good as MacCulloch and Wallis, where it is 140cm wide, and made in Italy, but then they charge around £24m. So, given the very affordable price, I have been using it with abandon. Including on this garment. It is so light and delicate and makes me feel like I am sewing with air. Making meringues! It reminds me of wedding dresses (when I have used it before) and it has an ethereal, other worldly quality. You do feel like a couture seamstress using it, smoothing it against the fashion fabric, pinning with silk pins, basting all the seams and darts. snipping the excess off with small, sharp scissors. 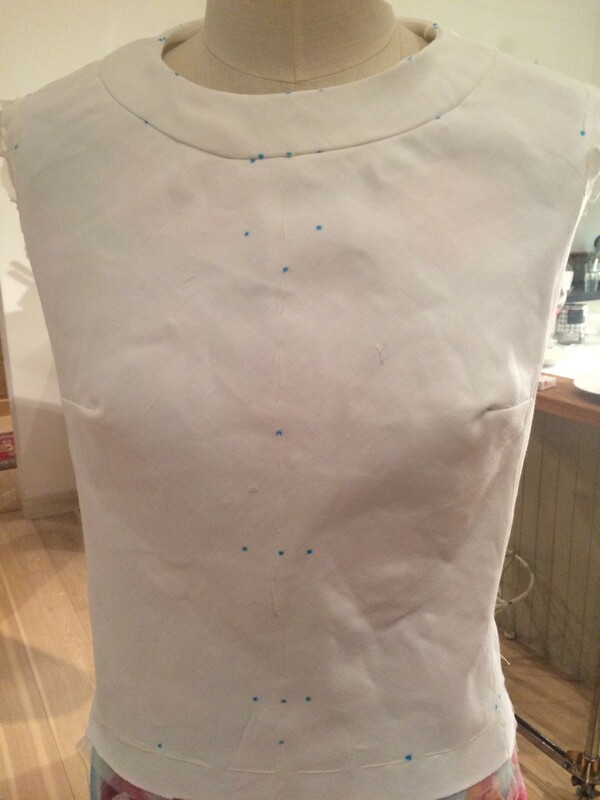 This garment has taken quite a long time, and I found it boring process – it’s a repeat. The fabric is a neutral. White is difficult to keep clean. And the pattern seems to go on and on. Once you have finished the shell, you put in the neckband which is a fiddle and hard to get completely even. 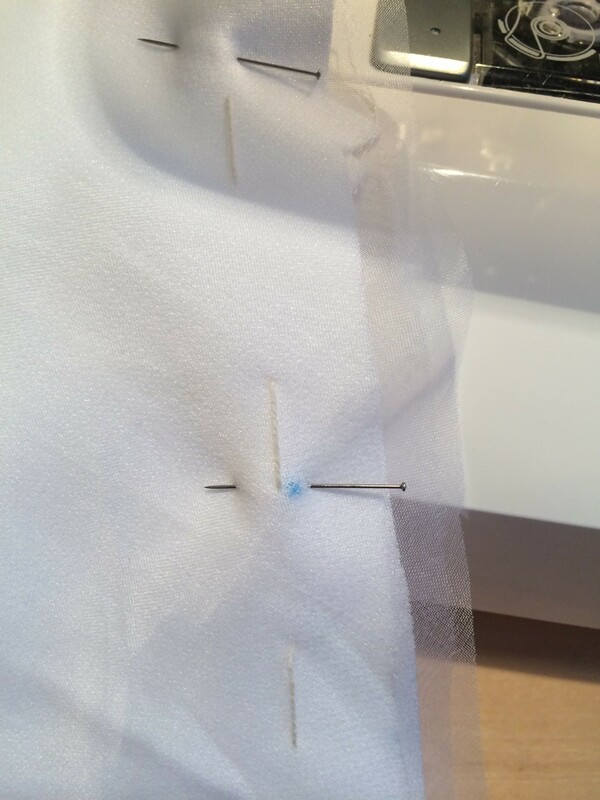 Then you put in the separating zip by hand. After that comes the armhole facings and the hem. When you think you are almost done you have to construct the front band which has a bound button hole in it. This is also done on the bias and again it is hard to get it all to behave. It’s a bit wonky so I think I will have to redo it. This weekend I will try to find a special button – Sharon on Clitheroe market has some vintage ones – and attach the hooks and eyes. And give it a proper press – it looks a bit sad hanging on its hanger. In terms of the SWAP I am almost finished. I have nine completed items. I have one ready to wear item as permitted. So its just the silk dress to go. I have two competing ideas to resolve now – one is a summery dress in a floral design, the other a version of an LBD. Two very different garments, two weeks left to the big reveal. I will have to decide and get on with it now. Wow, that is a lot of work you have put into the swap challenge. I can’t wait for the big reveal. The white tops looks like the extra fiddling will pay off,the detail and construction will speak volumes. I am convinced your silk dress will be a show stopper. Keep your spirit up, your almost there! Wow! Excellent! Sounds like hard work, K., but the result is accomplished. Thanks for sharing the silk organza information. Kate I don’t care how removable those pen marks are they gave me apoplexy just looking at them – you are fearless! I had a look at that eBay site and immediately recognised the white and coral silk. Warning, it was so thin I haven’t been able to use it and will have to block fuse first I think. These shops have quite variable stock I think. I bought a few other shockers from them too! Repeats can be very tedious, but this is such a useful and beautiful piece in the making. A neutral top that can be worn with dozens of outfits works very hard in the collection, it looks lovely already.